SR002 is a 3 track EP from ItaloBros. We start with Proper, this track alone has received some remarkable support, the rolling energetic beat is a surefire way to get the dance floors moving. 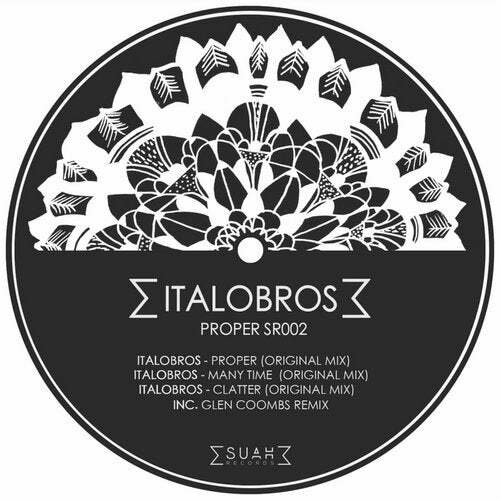 Many Time & Clatter are simply superb examples of the ItaloBros sound; 2 tracks that signify just how raw their productions are. The EP concludes with a remix from Glen Coombs, bringing a more forward-thinking production style onto the release. This track evidences the words of many respected artists that Coombs, is an artist to watch for the future. This is one release weâve been itching to get out. From a duo that's taking the scene by storm, the ItaloBros release another fine example to confirm that the underground, old school house music sound is still very much alive. A duo that strive from exploring and experimenting new paths, as well as reinventing new musical languages by inputting their own unique sound. Glen Coombs is someone we've had eyes on since our establishment. The Maidstone DJ/Producer has very quickly and effectively put his sound on the proverbial map of underground house and techno, it was only right for us to ask him to remix the work of the Italian outfit.